Since our founding in 2014, The Good Grocer has been delivering healthy snacks to happy customers all over the country and to military personnel serving all over the world. NO ARTIFICIAL COLORS, FLAVORS OR PRESERVATIVES IN ANY OF THESE DELICIOUS SNACKS! 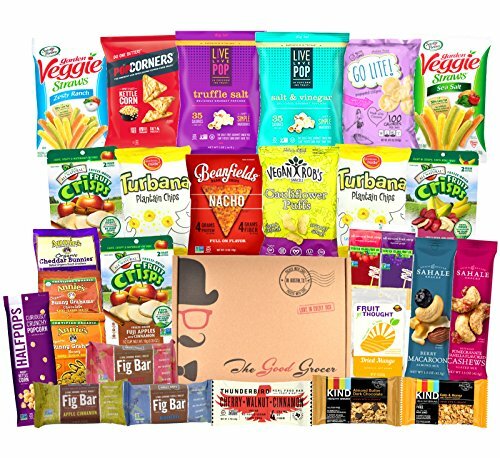 The Non-GMO Healthy Snacks Care Package by The Good Grocer is a collection of 28 grab-n-go snacks. These healthy snacks are all natural and free from GMOs. This healthy snack box includes a mix of yummy savory and sweet snacks that everyone will love. PERFECT GIFT FOR A HEALTHY DIET: GMO-FREE snacks that you can trust. Perfect for students, military, college care packages, get well soon care packages, office break rooms, road trips, college dorms, colleague and client appreciation gifts and more! Great for holidays, birthdays or housewarming gifts too! This Non-GMO Healthy Snacks Care Package is a fun and hip alternative to gift baskets. BEAUTIFULLY PACKAGED: Snacks come packaged in our awesome gift box. It's really cute and earth-friendly too! All of our boxes are made from 100% recycled materials. If you have any questions about this product by The Good Grocer, contact us by completing and submitting the form below. If you are looking for a specif part number, please include it with your message.